The anti-collective bargaining group Protecting Michigan Taxpayers (PMT) has sent out some outlandish information regarding Proposal 2. Proposal 2 would guarantee collective bargaining rights in the Michigan Constitution should voters approve it in November. 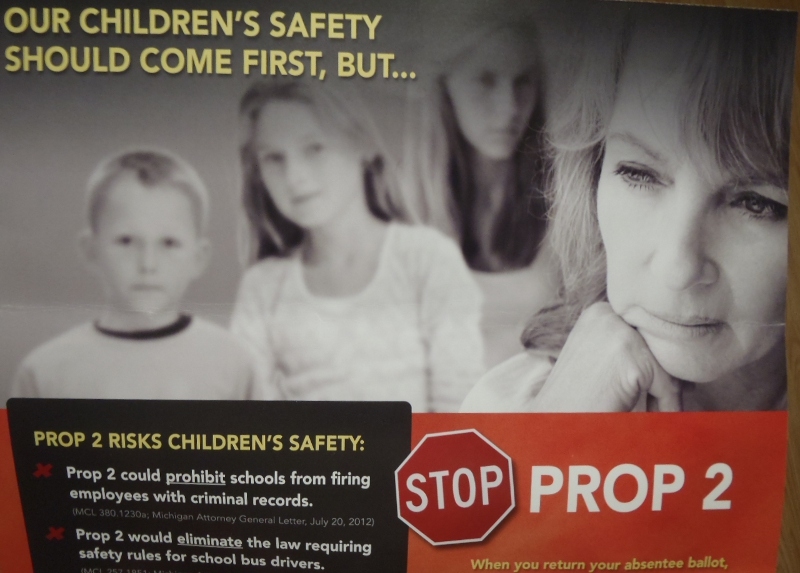 PMT’s advertisements falsely claim that collective bargaining rights could “prohibit schools from firing employees with criminal records” and “eliminate the law requiring safety rules for school bus drivers.” Using lies to confuse voters is nothing new in politics. However, PMT takes their unethical behavior to another level by skirting the spirit of Michigan’s campaign finance laws. PMT has been able to purchase 1.7 million dollars worth of advertisements without yet disclosing a cent of where that money has come from. Their first campaign finance report showed no contributions and a debt of $140,000. That money apparently was spent for the development of advertisements by out of state companies. I have to wonder how a brand new organization such as PMT could get $140,000 worth of credit from companies in Virginia and Washington D.C. PMT will have to disclose their donors in their next report. However, the second report isn’t due until October 30th, just days before the election and after some have already voted via absentee ballot. We do know that PMT’s president is a guy named Jared Rodriguez. Rodriguez is one of the four officers of the West Michigan Policy Forum (WMPF). The WMPF lists as one of it’s goals the implementation of a “freedom-to-work status” which appears to be another way of saying we should make Michigan a “right-to-work” state. One of the other officers of WMPF is Doug DeVos. The DeVos family has spent over a million dollars funding an anti-public education group called The Great Lakes Education Project. It would be hard to believe that the DeVos fortune isn’t also the driving force behind Protect Michigan Taxpayers. The only thing being protected by the work of PMT is the identity and wealth of its contributors. I’m willing to bet that most of the contributors to PMT are multi-millionaires. We will find out all the details on October 30th, which fittingly is Devil’s Night. This entry was posted in Collective Bargaining, DeVos Family. Bookmark the permalink. Attorney General Bill Schutte Sides With Billionaire Vegas Casino Magnate Over Michigan Workers.